Here at the Insights Centre you will find client case studies, white papers, brochures and blog posts that provide thought leadership on the industry and more information on WDX ONE. Meet the people behind WDX at one of our many events and find out more out our awards as we’re especially proud when our success is recognised. Wealth Dynamix, a leading global client lifecycle management solution provider was last week crowned ‘Best CRM System’ at the WealthBriefing European Awards 2019 held at the Guildhall in London. The triumph is yet another milestone in the company’s drive to be recognised as leaders in this space. We are delighted to have been ranked in this prestigious listing for the world’s most innovative WealthTech companies of 2019. 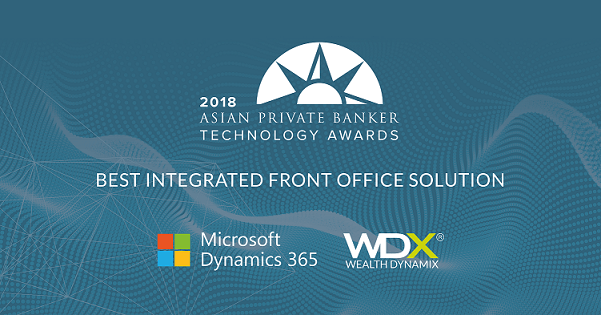 Wealth Dynamix, a leading global client lifecycle management solution provider was crowned “Best Integrated Front Office Solution” with Microsoft at the Asian Private Banker Tech Award 2018. The award luncheon was held on the level 62, Tower Club Singapore. Wealth Dynamix, a leading global client lifecycle management solution provider was last week crowned ‘Best CRM System’, ‘Best Change Management Process/Implementation’, ‘Best Innovative Client Solution’ and ‘Outstanding Contribution to Wealth Management Thought Leadership’ at the WealthBriefing Swiss Awards 2019. Wealth Dynamix, a leading Client Lifecycle Management Solution provider has been shortlisted for 8 awards, including Onboarding, CRM, Compliance and Thought Leadership categories, at the Wealthbriefing European Awards 2019. Wealth Dynamix were shortlisted alongside Avaloq and Profile Software for the ‘Outstanding Front-End Digital Solutions Provider’ and ‘Excellent in Customer Experience’ at the Private Banker International Swiss Awards 2018. Wealth Dynamix were proudly named double winners of these prestigious awards in Zurich this week. Wealth Dynamix, a leading Client Management Solution provider has been shortlisted for 7 awards, including Onboarding, CRM and Thought Leadership categories, at the Family Wealth Report Awards NYC 2019. Wealth Dynamix is delighted to be recognised for its ‘Best CRM System’ for three years running at the Goodacre Systems in the City awards. To add to this success, the team’s Senior Support Analyst, Martin Lund, was awarded ‘Support Specialist’ of the year. Wealth Dynamix beats stiff competition from the likes of Temenos, Appway and Avaloq to win ‘Outstanding Digital Solutions Provider’ at the 2018 Private Banking & Wealth Management awards in London earlier this month. Wealth Dynamix (WDX), one of Europe’s leading Client Lifecycle Management solution provider was last night awarded ‘Best CRM System’ at the WealthBriefing European Awards 2018. In just over a month, General Data Protection Regulation (GDPR) comes into force, but the panel members’ on-going discussions with financial services firms have confirmed that many are lagging somewhat behind in their preparations. Wealth Dynamix, a global client lifecycle management solution provider was last night crowned ‘Best On-boarding solution’ at the 5th Family Wealth Report Awards 2018 held at the exclusive Mandarin Oriental, New York. Wealth Dynamix (WDX), a global Client Management Solution provider have been shortlisted for 6 categories for the WealthBriefing European Awards 2018. ‘Best Compliance’, ‘Best CRM System’, ‘Best Change Management Process/Best Implementation of Technology Solution’ and ‘Outstanding Contribution to Wealth Management Thought Leadership’. John Beloe, our Senior Product Consultant, spoke at the Compeer Compliance Conference, taking a very interesting approach to how firms should tackle GDPR. Wealth Dynamix (WDX) were shortlisted alongside Avaloq and Profile Software for the ‘Outstanding Front-End Digital Solutions Provider’ at the Private Banker International Swiss Awards 2017. WDX were proudly named the winners of this prestige award in Zurich on 12th December 2017. Wealth Dynamix (WDX) have been shortlisted for 8 awards at the Wealthbriefing Swiss Awards 2018. WDX today announced that it ranked number 19 in the 2017 Deloitte UK Technology Fast 50, a ranking of the 50 fastest growing technology companies in the UK. Rankings are based on percentage revenue growth over the last four years. WDX grew 1,563% during this period. The last video of the series looks at combining humans and machines in Private Banking. Although there are a range of both accelerators and disruptors affecting digital transformation, it is clear that private clients fear the ‘nuclear’ option of their entire portfolio being managed by a machine. The third video of the series looks at fact access to data and analysis. More specifically, discussing whether addressing the previously unwieldy ‘onboarding’ process been a core part of the private banks’ workload. The second video of the series looks at the digital solutions available to relationship managers. As private banking shifts from being a supply to demand-driven industry, the days of purely selling products are over, as clients seek relationship managers for advice and to help them meet like-minded wealthy families. In our recent round table with PWM, we looked at the digital challenges wealth managers are faced with and the importance of overcoming them as an industry. The first video of the series looks at technology as a client acquisition tool. Britain’s fastest-growing private tech companies were announced in the 17th annual Sunday Times Hiscox Tech Track 100 league table on 10th September 2017. Video coverage of the WDX & PAM Digital Forum 2017. WDX has been named a finalist in the 2017 WealthManagement.com Industry Awards in New York. A record number of nominations were submitted this year- nearly 500 entries were received from more than 300 companies- so being named a finalist is quite an accomplishment. WDX are proud to announce winning the ‘Best CRM Solution’ 2017 for the second year. The company were awarded for their ‘expertise and track record in delivering CRM and client on boarding solutions’. The results will be discussed by a panel of experts at the 2017 PAM/WDX Digital Forum on 21 June 2017. The Forum is open to attend for wealth managers, private bankers and the like that deal with digital at their firm. WDX was crowned ‘Best Technology provider- Front Office’ at the 5th Wealthadviser Awards for the second year running. WDX are looking forward to joining Multrees for ‘A Meeting of Minds Wealth Management & Private Banking’ on 15th June 2017 in London. WDX will be joining the WealthBriefing MiFID II Summit on Wednesday 24th May 2017. WDX is joining Rexigon Securities and FNZ for the ‘Are you ready for MiFID II ?’ conference. As part of our annual digital series, we have been working closely with PAM Insight to explore the shifting landscape of regulation, changing consumer habits and digital transformation and the implications it has had on the wealth management industry. WDX are proud to announce that we have been shortlisted for 5 awards at the Wealthbriefing Swiss Awards 2017. WDX, one of the Switzerland’s foremost technology providers, has been shortlisted for the WealthBriefing Swiss Awards 2017. WDX are proud to be bronze sponsors of this fantastic Marketforce event. WDX is exclusively co-sponsoring the CEO dinner with WMA and we are also looking forward to being the coffee sponsors for this year’s WMA annual summit for the second year in a row. WDX will be hosting an intimate round table with PAM Insight and Accenture to explore digital onboarding with selected industry experts. This event will be focusing on fintech and digitalisation, with an exciting agenda filled with many industry leading speakers. “Marketing Specialist of the Year” goes to our Marketing Manager! This week Goodacre hosted the Systems in the City Awards 2016 at London’s Banking Hall. Wealth Dynamix are proud to be sponsoring the PAM Digital Survey & Forum 2016. We are sponsoring the Goodacre City of London Wealth Management Awards 2016 and we are really looking forward to it! WDX has been voted Best Technology Provider Front Office for The Wealth Adviser Awards 2016. Linking in with and following on from our Digital Survey & Forum at the end of last year, we want to look at the important ingredients of the Digital Revolution. It was a pleasure to be a part of the PAM awards with The Wealth Net this year at The Dorchester, London. It is a pleasure to be a part of the PAM awards with The Wealth Net this year at The Dorchester, London. We are really looking forward to being the coffee sponsors for this year’s WMA annual summit! Wealth Dynamix has been awarded the GoodAccredited Standard for 2015. The event will feature three panel discussions, offering you a number of opportunities to take part in a range of discussions that best suit the needs of your organisation. Our groundbreaking Breakfast Briefing, “Harnessing Technology to Tackle Conduct Risk”, is now only two weeks away. WDX are bronze sponsors and will be attending the Compeer Compliance Event on 26th February. WDX, one of the Europe’s foremost CRM Solution providers, has been shortlisted for the WealthBriefing European Awards 2015 for Best CRM system. We are delighted to announce that we have been shortlisted for this fantastic award. Come let us hear your point of view and join in the discussion with us! WDX, one of Europe’s foremost CRM Technology providers to the European Wealth Management industry was crowned ‘Best IT Newcomer’ at the WealthBriefing European Awards 2014.